Adaptive Software Solutions: So you want to be an expert? 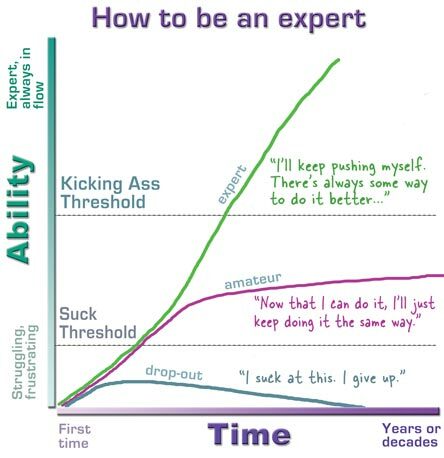 Who doesn't want to be an expert? (Just in case you have stopped here and are pondering whether you want to be an expert... then you have a serious problem buddy. But nothing that the Creating Passionate Users blog cannot resolve). Well I will not rant on this topic because Kathy Sierra has said it in such a wonderful way, that I will simply point you to an image from her blog. The image says it all. I think there is another important aspect of learning, and that is sharing. An expert if doesn't have ability to share things with others then his/her knowledge is of little use. The ability to share is not easy and not everybody is good at it. But just like anything else in life this can be learnt and improved with time and practice. This is my third comment today on your site, you must be thinking this guy has gone crazy but I am very happy to see your blog and you have always been an inspiration. I agree. Sharing is one of the most important things to do with knowledge. It is almost an oligation. Most inventions are made on the foundations of thoughts and knowledge that have been shared by great and generous minds. Sharing is one of those things... the more you do the more you help others as well as yourself. Keep the posts coming. I'm glad you like the site. Thanks.